At this stage of the week I hope the hangover has eased if you joined in the celebrations on Sunday – and Monday – and Tuesday….although I’m sure the sense of euphoria throughout the city and county will last a good while longer, and rightly so. As the champions prepare to return to their well-deserved welcome in the City of the Tribes, as well as towns and villages throughout Galway, the green-fingered might like to consider showing their appreciation in a horticultural way. After all, flags and banners in the county’s colours of maroon and white have fluttered from windows and decked our streets for weeks. Why not include our window boxes, hanging baskets, front gardens and even roundabouts – all areas where the hard working members of our Tidy Towns groups do so much to cheer up and beautify our streets for everyone’s benefit. If you’d like to include a lasting tribute in your own garden to commemorate this week’s victory, you’ll be spoiled for choice with shrubs, flowering perennials and bulbs of varying sizes all available in maroon and white. Let’s take a look at some shrubs first –The vigorous Sambucus “Black Lace” is gorgeous if you have room for it and has finely cut dark purple foliage. Berberis thunbergii “Atropurpurea” is medium sized and colours up beautifully in Autumn. There’s also a dwarf form, Berberis atropurpurea “Nana”. In a smaller space, the brilliant little Pittosporum “Tom Thumb” has small, curly leaves in a fabulous maroon which is really hard to do justice to in a photograph. Evergreen and hardy, it’s one of my favourites for planting plans and forms a lovely neat mound. For a maroon and white scheme, one of my favourite shrubs would have to be Buddleia “Silver Anniversary”, sometimes known as Buddleia “Morning Mist” – much more compact than most buddleias with soft silvery foliage and white flowers. Convolvolus cneorum is a lovely shrub for a smaller space with silvery white evergreen foliage and white trumpet shaped flowers in summer. If it’s flowers you’re after, now is a great time of year to seek out rich tones of burgundy and maroon. Dahlias are your best bet, with “Rip City”, “Jowey Mirella” and “Nuits d’Ete” among a host of chocolatey maroon shades. The Japanese anemone “Honorine Jobert” is in flower everywhere right now, its glowing white petals lighting up shady spots or gleaming in autumn sunshine. 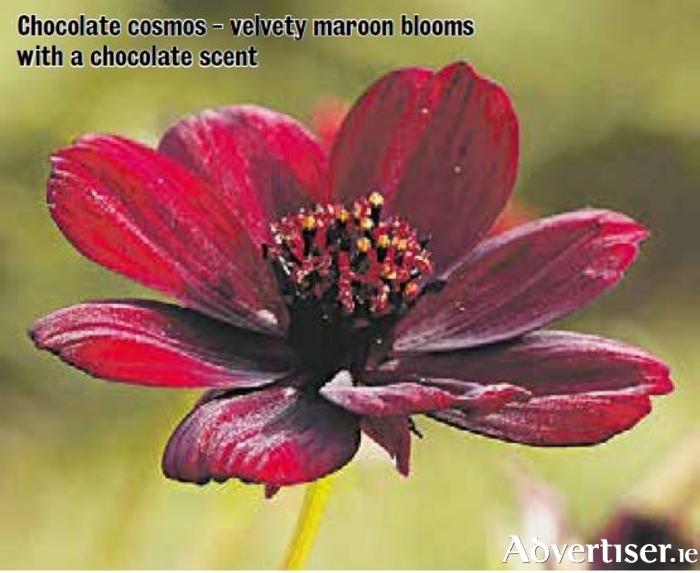 Chocolate cosmos, although not reliably hardy, is very hard to resist – it doesn’t just look great, it really does smell of chocolate! This is also a great time of year to begin choosing and ordering your tulip bulbs – although you’re better off planting them from November onwards, order early to get the best varieties. Tulipa “Burgundy”, “Black Parrot” and “Queen of the Night” are all wonderful rich maroon shades. “White Triumphator” and “ Mount Tacoma” are super white ones, the latter a sumptuous double peony-flowered type. With all these fabulous choices, you can show your support for your county while at the same time making your garden more beautiful – a win-win really. Turns out we’re good at those here in Galway!